Many projects involve teamwork, and the roles involved usually include some that are more glamourous and some that are less so. Even so, the less appealing jobs are often crucial to the success of a project. 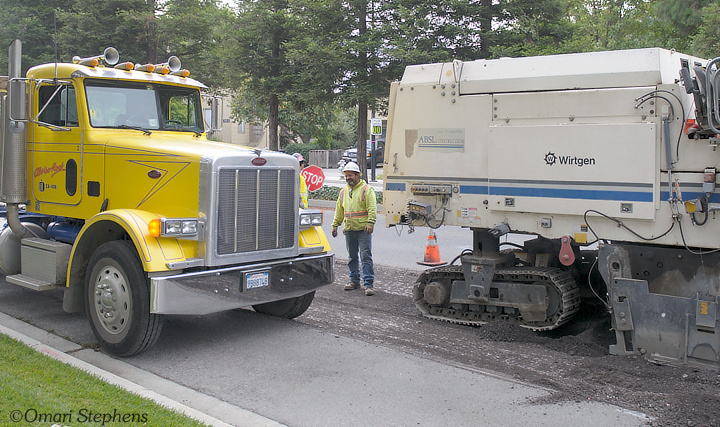 This is especially apparent in any sort of construction project, including various forms of road work. 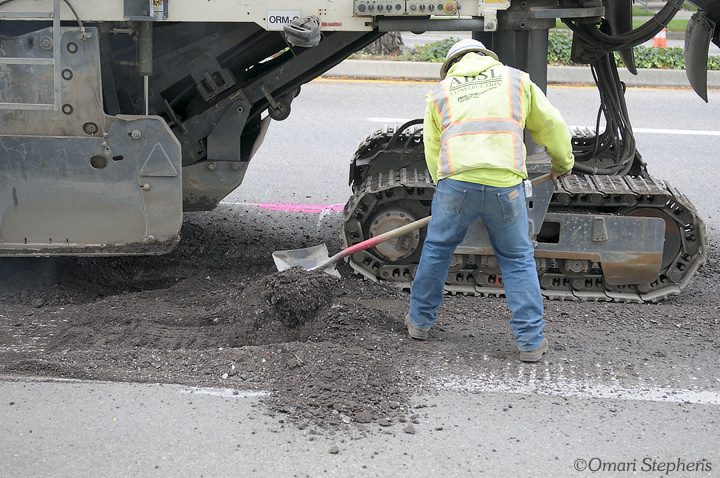 In Part 1 of "Roadwork," I watched what could be considered a microcosm of a normal road project: under an hour from beginning to end, and only handful of people directly involved. Part 2 covers a larger-scale project. 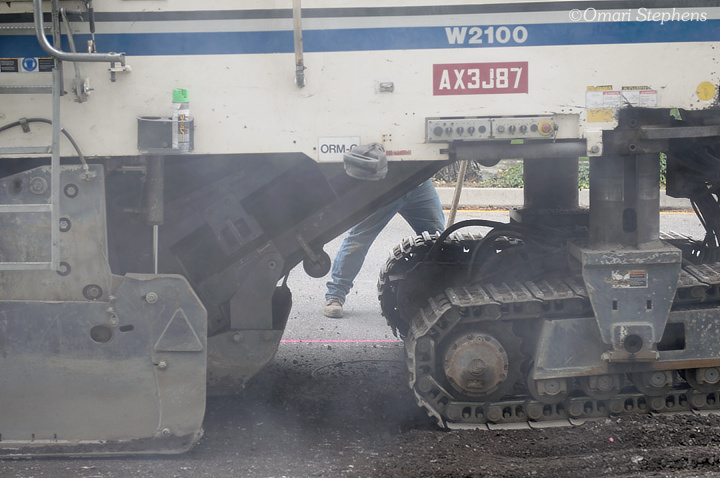 Around two weeks ago, I spotted a team doing some grinding in preparation for re-paving a couple spots on Charleston Rd., right next to the Googleplex. I had never seen this in action before, so I decided to hang out and watch. A team of two folks operated this cold milling machine. The main driver was situated on top, where he had a clear view all the way around the machine. This guy was on the ground, and did a couple jobs from shoveling and marking to making fine steering adjustments to keep the giant machine on its mark. One of his primary jobs was to make sure the cuts started and stopped in the right places. Here, he had just marked the starting and stopping points for the manhole and manhole cover using some green spraypaint. After every cut, he would make a hand-signal to the main driver when the machine had reached the mark. It was clear that the two were comfortable working with each other. Most of the time, a quick hand-signal conveyed a mutual understanding of what was being "said." At one point, though, they stopped to have a quick chat. Unfortunately, I couldn't hear what they were saying over the din of the engine. I'm often surprised at how much equipment these guys can cram into a seemingly-narrow space. 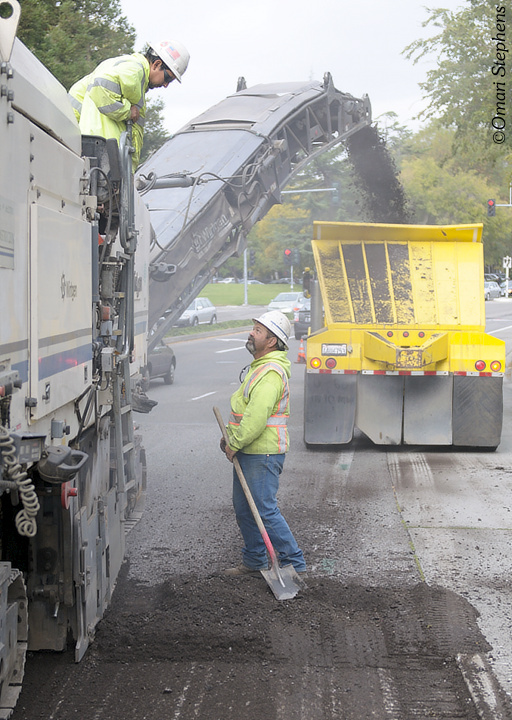 At one point, the milling machine was a few inches inside of the center lane line, and a truck calmly drove past over the bike lane. "Is photography art? Is cooking an art? Is loving an art? Is art art? Only when it is raised to the level of art."